10 INCH COMBINATION EDGE PULL / SIDE PULL, BUTTERFLY LATCH 4 WHEEL CASE WHILE SUPPLIES LAST! 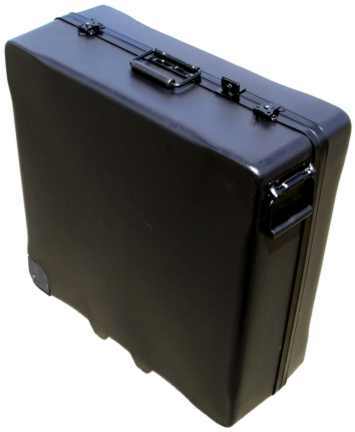 A hard case will provide the highest level of protection for your bike. They are ideal when you start and finish the cycling portion of your travel from the same place. They also work great when you have the ability to ship the empty case ahead to a point where it will be needed for your next flight.. Some framebuilders offer trailer options (shown below) that work in conjunction with our hard cases for those who want to take the case along with them while touring. 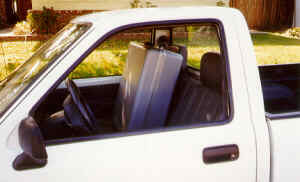 Towing the case solves the problem of what to do with it as well as making a great container for touring gear. For maximum protection, we recommend that 3 or 4 compression members be used to stiffen a case. 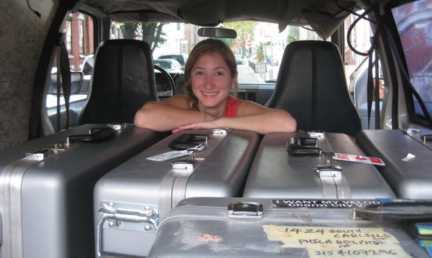 All of our cases are small enough to fit in the front seat of a compact truck or in the trunk or back seat of most cars so no special transportation is necessary to get to and from the airport. 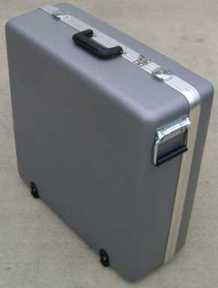 Some of our cases are available in a 12" oversize version but this size does not meet airline size requirements. 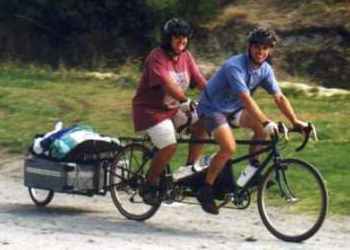 Although some people choose an oversize case for a single bike, we don't recommend it since there is a possibility that you will be charged for oversize luggage. It's very rare that a single bike won't fit into a 10" case. Packing a bike for the first time is like learning anything new, it takes following instructions, experimentation and practice. Packing tips are available here. 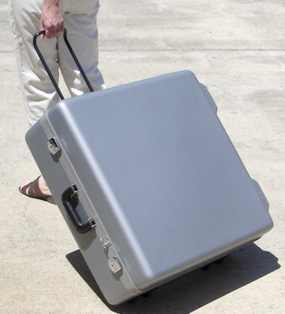 Our oversize cases are designed to accommodate bicycles (typically tandems or recumbents) that won't fit in a 10" case. 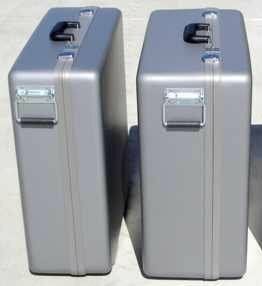 For tandems that won't fit in a single 10" case, we normally recommend two 10" cases instead of using an oversize case. That way, the extra space in each case can be used for miscellaneous items and clothing and since there are normally 2 people traveling with a tandem, you won't get charged for the second case. Since many airlines add a fee for cases that weigh over 50 pounds, be especially careful to check the weight of an oversize case before you get to the airport since it's easy to exceed the weight limit. We offer three hard case construction methods to better meet the needs of our customers. 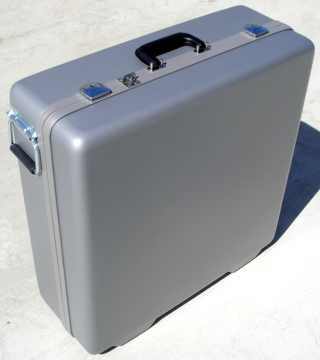 Our original USA made gray hard case, with its rugged look, has been in use now for over 10 years and it is known for its good looks, strength and durability. We rarely hear of one of these cases being damaged. Our newest case, with butterfly latches, is made in the USA. The wide wheel spacing provides excellent stability when it's pulled on its edge. They are rugged and suitable for hard service. Has wheels along the narrow edge and it pulled on its edge. This configuration is best for maneuvering in tight places like airports or train stations. They are less stable than a side pull case especially on an uneven surface. Our new Butterfly latch case is the most stable edge pull case that we offer. This configuration is very stable even on uneven surfaces. Has wheels on the narrow edge and wheels on the side so it can be pulled either way. Can be pulled on edge in tight places and on its side over rough terrain. A handle is located on the side opposite of the wheels. The case is pulled at the side of the person pulling it. Some edge pull cases are pulled by a telescopic handle built into the case that extends above the case to make it convenient to to reach. These add cost and the handle increases the size of the case. Some edge pull cases are pulled by the carry handle located on the top if the case. These are more economical but not as easy to use as a telescopic handle. These do not increase the size of the case. We rarely see any damage to these cases. The shell is made from silver-gray high density polyethylene which is extremely tough. Industrial style handles and hardware for strength and durability. Padlock tabs so a regular padlock can be used in addition to the locking latches for added security. Heavy duty recessed ball bearing wheels. Spring loaded steel flip out handle for pulling the case. Molded in feet so they can't be broken off and they are farther apart for added stability. 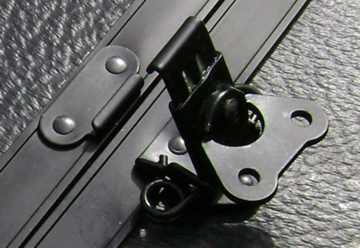 We stock all the latches and hardware in the event that something gets damaged. Available in 10 and 12" sizes. No liner so it can easily be washed out after that mountain biking adventure. Case dimensions are 26" x 26" x 10" (click here for a dimensioned drawing of the case interior) which meets the typical airline standard maximum size limit of 62" combined (length + width + thickness). The standard 2 wheel case has an improved wheel configuration that greatly improves the stability of the case when it's being pulled. Our old style case was more stable when being pushed rather than being pulled. To convert an older push style case to a pull style case, click here. Flip out handle and 2 wheels on the narrow side. 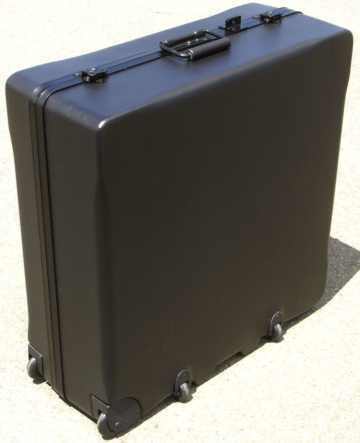 Oversize Our original 2 wheel edge pull hard case is also available in a 12" oversize version but this case does not meet airline size requirements. 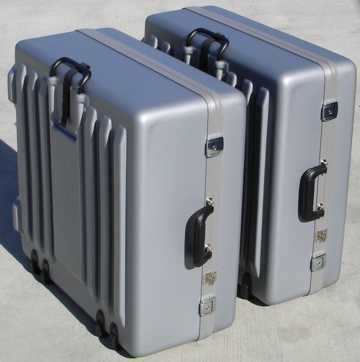 Compare our 10" hard case to the 12" oversize versions. This case has 4 wheels located on the wide edge of the case so it's very stable when being pulled on uneven terrain or sloping surfaces. We also added a telescopic pull handle which provides extra clearance between your feet and the case. The ribs on one face were added to protect the center section that houses the pull handle. Although the basic case is 26"x26"x10", the same inside dimensions as our 10" case, the ribs add another inch to the 10" height of the case for an over the ribs dimension of 11". Technically this case is oversize so you may get charged for it however some airlines ignore feet and ribs when measuring so they accept it without an extra charge. The same 10 inch compression members that are used with our standard case work with this case. The ribbed side of the case can be seen in the photo below showing the 12" version of this case. 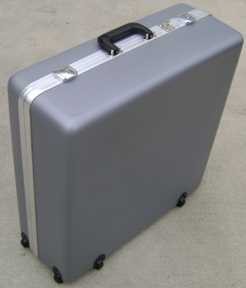 Oversize Our side pull case is also available in a 12" oversize version but it does not meet airline size requirements. The shell is made from textured black high density polyethylene which is extremely tough. Industrial style handles and hardware for high strength and durability. Two rugged steel butterfly latches that can take a beating without breaking. Padlock tabs so a regular or TSA approved padlock can be used. Wheels are placed farther apart than any other case we offer for extra stability when being pulled. Wheel pockets "molded in" instead of "cut in" for extra durability. Durable, full length, piano hinge. Rugged spring loaded steel flip out handle for pulling the case. Rugged spring loaded steel flip up handle for carrying the case. We stock all the latches and hardware so in the unlikely event that something gets damaged, it's repairable.. Lighter than our original hard case style so you can carry more cargo inside without exceeding the weight restrictions. Due to its wide wheelbase, this case is very stable when pulled on its edge. Case dimensions are 26" x 26" x 10" which meets the typical airline standard maximum size limit of 62" combined (length + width + thickness). Case dimensions are 26" x 26" x 10" which meets the typical airline standard maximum size limit of 62" combined (length + width + thickness). Uses the carry handle as the pull handle when pulling it on its edge which is the same configuration that we use on the Designer style case shown below. An Around the World test of the Bilenky's trailer/suitcase is complete and now this marvel is in production. Thanks and congratulations go out to David & Kiki of merry old England for all their help in the testing of the Bilenky one wheeled wonder. The turtle tow is single 16" wheel trailer custom fabricated to be used in conjunction with an S & S hard case; the chassis can be removed from the case and are packable into the case with most of a coupler single bike. (you will need some type of collapsible soft pack or wheel bag for your bike's rear wheel. The design features: 4130 tubing, ball bearing headset, and internal tubular bracing, external anodized aluminum edging for the hard case - distinguishing this from currently available standard one-wheel trailer modifications. Our new lower pricing for the trailer unit is $395; $745 complete with hard case. 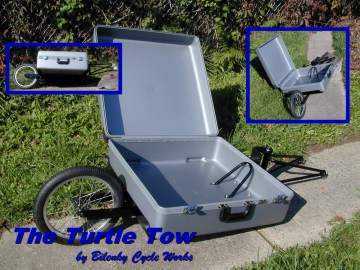 Please contact Bilenky Cycle Works to purchase this trailer case.